The easiest smart solution is to just repurpose and old Android or iOS device. There’s no programming or soldering—just activating the always listen function on the device. Yet, unless you’re going to rely on the audio output built into your phone or tablet, you’ll need a speaker to pump out your tunes and your chosen smart assistant’s responses. Any speaker with an aux in port or Bluetooth capabilities will do, but for the sake of stability and consistency, you’re probably better wiring everything up. 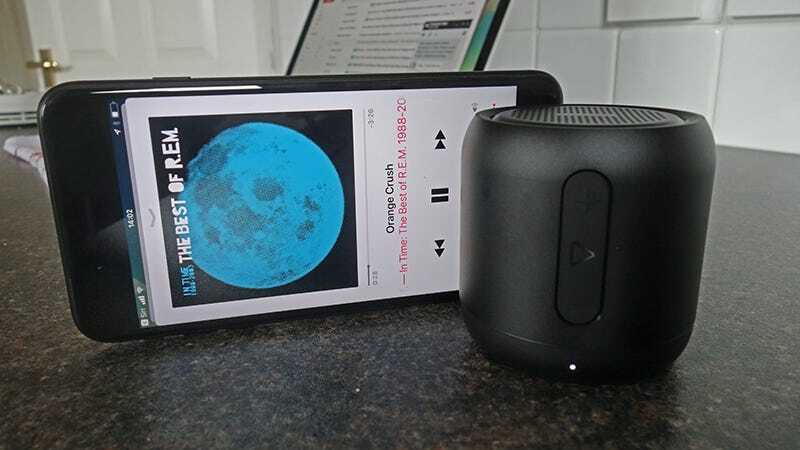 In our case, we used an Anker SoundCore Mini to test some smart speaker setups with, which does the job perfectly well and pumps out a very good level of sound for its size. If you’re more concerned about audio quality, get a bigger and more expensive speaker instead—the beauty of setting up your own smart speaker is that you’ve got the choice. At the core of the Google Home is the Google Assistant, so if you’ve got a spare Assistant-enabled phone lying around you can connect it up to a speaker to create a makeshift Google Home—depending on your speaker, you might get better audio performance that the Home too. You can even get the Assistant on the iPhone now, though you don’t get the instant voice activation feature that would turn your old iPad or iPhone into a Google Home. If you’ve got an old iPhone or iPad knocking around the house then you can hook it up to your speaker of choice and hey presto—you’ve got a HomePod, minus all that sophisticated sound tweaking, and without the glowing orb on top of the speaker. You’ve even got the benefit of a screen if you need one, and you don’t have to wait until the end of the year to have it. You can’t integrate Alexa into Android or iOS the same way you can the Google Assistant or Siri (well not unless you’ve got a Huawei Mate 9), so you’ve either got to use a slightly clumsy workaround or take a more DIY route if you want to build your own Amazon Echo—and we’ll mention them both here. The first option is to use the Amazon app for iOS, connect your iOS device to your speaker, and tap the microphone button in the top-right corner of the app’s front screen to enable Alexa. Virtually all Alexa commands and skills will work in the latest version of the app, but you need to manually launch it—pretty less than ideal. If you really want to create a decent Amazon Echo replacement without an actual Amazon Echo, you need to take the Raspberry Pi route—you can install Alexa at a basic level here, without the interference of iOS and Android, though the process is more involved. Thankfully our friends at Lifehacker have a comprehensive walkthrough. Of course, these alternative smart speaker setups aren’t for everyone—the experience isn’t quite as seamless, and you can pick up an Echo Dot pretty cheaply—but it’s a fun way to get some extra use out of an old phone or tablet that’s not doing anything much.